Until recently, many fast growth organizations have suffered huge performance gaps in what is known as their Middle Office. As the name implies, the Middle office is operational in nature and sits between the enterprise Front Office and Back Office. The Front Office has traditionally been supported by Sales and Marketing CRM solutions. These solutions include Salesforce.com, Siebel, MS Dynamics and Marketo. The Back Office has traditionally been supported by large ERP players such as Oracle, SAP and Infor. Unfortunately, that left the “Middle Office” to fend for itself. In order for Middle Office Organizations to gain efficiency and remain compliant, they were forced to either create customized software and/or hire small armies of operational staff to execute manual or semi-manual processes. 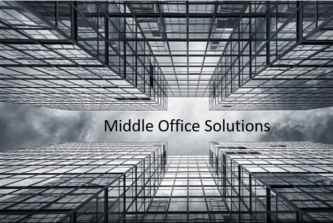 We define the Middle Office as the Operations Organization that focuses on managing financial, operational and legal risk, calculating profits, controlling margins and sourcing goods and services. The goal of the Middle Office is to optimize business transactions that meet customer and supplier requirements while maximizing the value of the company. These operational sub-groups typically manage the Quote to Cash, Source to Pay, Contract Lifecycle and Digital Commerce functions of the organization. This includes the Sales Operations side of revenue generation, corporate relationship management as well as purchasing cost management activities involved with acquiring goods and services. Middle Office Software is a new transformative solution category that provides significant financial, compliance and efficiency benefits. Workflow automation, approval management, automated quotes and contract lifecycle management have historically required a hybrid solution involving customized software, multiple integrations and a patchwork of vendor solutions. Middle Office platforms now provide the ability to seamlessly configuration, price, quote, create a contract, bill, track revenue, service e-Commerce relationships and leverage predictive analytics. All this can now be implemented much faster with significantly less upfront investment than in the past. This Middle Office Software category also enables smaller companies to use cloud technology as a force multiplier and punch well above their weight in terms of efficiency when competing with larger organizations. Currently, software vendors such as Apttus, Icertis, Oracle, NetSuite and Slack have independently created automation suites that facilitate these Middle Office functions. The Deal Desk acts as a Middle Office air traffic control center that coordinates between many different internal departments. This coordination enables the organization to consistently meet multiple business objectives simultaneously. The ability to control deal margins and guide sales team members to effectively use promotional offers and rebates can significantly add to the corporate bottom line. In addition, the ability to manage the renewal process efficiently, while enhancing the ability to upsell and cross-sell products and services is very powerful. From an organizational change perspective, establishing a Deal Desk function in the Middle Office changes the culture of the Front Office by driving new winning behaviors. Many rapidly scaling organizations need to consider the most efficient way to procure large quantities of high quality goods and services. Uncontrolled Middle Office processes that involve sourcing, vetting and on-boarding new supplier relationships can unnecessarily cost the organization tens of millions of dollars. In more raw material intensive industries, the ability to create vendor RFPs, invite potential suppliers, process bid responses and award contracts in a structured manner is central to business success. Software that facilitates high-volume vendor management along with integration of the purchasing department with Accounts Payable is critical. These systems provide transparency across the entire transaction life-cycle and enable optimization through AI analytics. Contract Lifecycle Management provides organizations the ability to effectively manage relationships with customers, suppliers and employees. The most visible and critical contract management functionality includes: 1) the ability to automate the process of relationship creation and management, 2) enhanced operational and financial visibility, and 3) overall reduced financial and compliance risk. Also, the ability for the entire organization to have access to relationship agreements enables superior internal and external communications. On the flip-side, many organizations tend to falter when they fail to effectively manage key commercial relationships and agreements. This in turn leads to excess costs and revenue losses which impact the enterprise’s ability to compete and grow. Digital Commerce is also a critical Middle Office capability. Customers and suppliers expect a seamless online and offline experience. Without a uniform customer experience, an organization’s brand is at significant risk. The ability to fully integrate the online Cart to Cash process with offline Quote to Cash process requires omni-channel capability and effective two-way customer communications. The goal of Digital Commerce is to provide a seamless shopping experience whether shopping from a web-based desktop, mobile device, telephone or via brick and mortar store. This ability to orchestrate the customer experience across buying and selling of goods and services is critical. In addition, the ability to consistently manage all channels (direct sales, channel partners and e-commerce shopping) truly differentiates the corporate offering. Self-service ordering that is seamlessly integrated with your quoting and contracting processes is now considered “required functionality” by the majority of customers. In addition, the ability to analyze customer product offers, pricing, and promotions and compare them to historically profitable orders is an effective way to optimize both revenue and margin. The ability to rapidly evolve processes, optimize organizational behavior and improve operational intelligence through analytics is key to every organization’s longevity. Enterprises that are currently suffering from both revenue and expenditure leakage by not having efficient Middle Office processes should be assessing these new Middle Office Technologies. If your organization is looking to leverage cloud, social, mobile, and AI to improve your company’s Middle Office operations, HBSC can help. Please contact us at client-development@hbsconsult.com or call us at 800-970-7995.